Falling profits force closure of the island nation's three McDonald's restaurants. Costs had doubled over the past year because of the fall in the krona currency and high import tariffs on imported goods, Ogmundsson said, making it impossible for the company to raise prices further and remain competitive with competitors that use locally sourced produce. 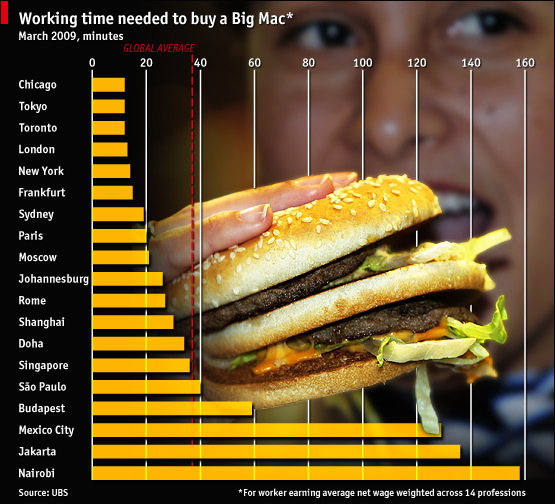 A Big Mac in Reykjavik already retails for 650 krona ($5.29). But the 20 per cent increase needed to make a decent profit would have pushed that to 780 krona ($6.36), he said. That would have made the Icelandic version of the burger the most expensive in the world, a title currently held jointly by Switzerland and Norway where it costs $5.75, according to The Economist magazine's 2009 Big Mac index. The decision to shutter the Icelandic franchise was taken in agreement with McDonald's Incorporated, Ogmundsson said, after a review of several months. "The unique operational complexity of doing business in Iceland combined with the very challenging economic climate in the country makes it financially prohibitive to continue the business," Theresa Riley, a spokeswoman at McDonald's headquarters in Oak Brook, Illinois, said in a statement. "This complex set of challenges means we have no plans to seek a new partner in Iceland." McDonald's, the world's largest chain of hamburger fast food restaurants, arrived in Reykjavik in 1993 when the country was on an upward trajectory of wealth and expansion. The first person to take a bite out of a Big Mac on the island was David Oddsson, the prime minister at the time. Oddsson went on to become governor of the country's central bank, Sedlabanki, a position that he was forced out of by parliamentary members earlier this year after a public outcry about his inability to prevent Iceland's financial crisis. Lyst plans to reopen the stores under a new brand name, Metro, using locally sourced materials and produce and retaining the franchise's current 90-strong staff. Ogmundsson said it was unlikely that Lyst would ever seek to regain the McDonald's franchise, with Iceland still struggling to get back on its feet after the credit crisis crippled its overweight banking system, damaging the rest of its economy, last October. "I don't think anything will happen that will change the situation in any significant way in the next few years," Ogmundsson said. It is not the first time that McDonald's, which currently operates in more than 119 countries on six continents, has exited a country. Its one and only restaurant in Barbados closed after just six months in 1996 because of slow sales. In 2002, the company pulled out of seven countries, including Bolivia, that had poor profit margins as part of an international cost-cutting exercise.